ASCOTT will open its eighth serviced residence in the Philippines in 2017, but has more recently announced the launch of its new web and mobile booking features to enhance search and reservation on its website. Available across its three brand websites, Ascott’s enhanced reservation system allows guests to view a list of all available properties, filter available apartments by price, view properties on a map and perform multi-city, multi-property or multi-apartment bookings within a single transaction. There will also be collapsible sections for ease of comparison across various apartment types and rate categories. Customers will also be reminded of the available, optional apartment upgrades and supplementary services before booking confirmation. Confident its websites offer the lowest rates for its properties, Ascott will give any guest who finds lower online rates a 50 per cent discount off the first night of stay and a matching rate for subsequent nights. Separately, Ascott will launch the Somerset Alabang Manila in 2017. The 150-unit property will be situated in Alabang, a major business district in Metro Manila and within Filinvest City, an integrated development offering office, retail, residential and leisure space. A 25-minute drive from the airport, the serviced residence is also within close proximity to the industrial parks of Laguna, Cavite and Batangas. Residents can choose from studio, one- to three-bedroom residences and penthouse units, all of which will come with a fully-equipped kitchen and living, dining and work areas. Other facilities include an outdoor swimming pool, gym, residents’ lounge, children’s playroom, meeting rooms and a business centre. Arthur Gindap, regional general manager for the Philippines and Thailand, Ascott, said: “We see immense potential for Ascott in the Philippines as the country continues to enjoy strong economic growth and to attract foreign direct investment. “Ascott already has a strong foothold in Makati City, the country’s primary financial centre, with three operating properties. Hence, we are actively expanding in other business districts where foreign direct investment has generated robust demand for serviced residences. As part of its diversification, Premiere Horizon Alliance Corp. is investing in a company that has an interest in an upcoming boutique serviced apartment project in Makati. In a disclosure to the Philippine Stock Exchange, Premiere Horizon said it subscribed to 25.6 million primary shares for 40 percent of First Ardent Development Corp. at a par value of P1. The transaction will allow the listed company to participate in the redevelopment of a building on Makati Avenue into a boutique service residence named Y2 Residence Hotel. The investment is seen to contribute to Premiere Horizon’s income and revenue stream through unit sales or rental income once the project is completed in August. “The transaction is an opportunity for the company to further its diversification efforts and venture into the booming tourism-related real-estate business,” Premiere Horizon said. Formerly named Premiere Entertainment Philippines Inc., the company obtained regulatory approval in December 2011 to amend its secondary purpose to include real estate and mining operations as the firm hopes to ride on the boom of these two sectors. The company continues to offer broadcast rights for its film library titles for TV, video, cable and other medium requiring such titles. Premiere Horizon also operates e-Games stations in Metro Manila and nearby provinces through Digiwave Solutions Inc., and has three operating subsidiaries—Premiere Events Palace Inc., PEP Metro Leisure Inc. and Premiere e-Teleservices Inc.
More serviced apartments in Manila !! The tower housing Fairmont Makati also is home to Raffles Makati, a 32-room, all-suite hotel, and Raffles Residences, featuring 237 one- to four-bedroom residences for both short and long- term stays. Raffles is a sister brand under the parent company Fairmont Raffles Hotels International.Fairmont Hotels & Resorts is pleased to announce the opening of Fairmont Makati on December 3, marking the brand’s entry into the Philippines. Ideally situated in one of the 17 cities comprising Metro Manila – one of the major financial, commercial and economic hubs in Asia – Fairmont Makati joins a growing portfolio of Fairmont hotels in the Asia Pacific region, including the recently opened Fairmont Jaipur in India and Shanghai’s Fairmont Peace Hotel. Fairmont Makati offers 280 spacious deluxe rooms and suites, including Fairmont Gold, the hotel’s exclusive hotel within a hotel. Conceived by leading architects Arquitectonica and interior designers Bent Severin International, the modern architecture features sophisticated style alongside the rich, cultural characteristics of Filipino design. Making use of abundant local materials such as coco-twig white resin, crushed mahogany seeds (embedded in the walls) and abaca laminated glass, a warm, neutral palette boasts colourful accents and detail finishes like pearl in-lay handles on mahogany wood. A focal point of each guestroom is the floor-to-ceiling glass windows overlooking the bustling city. Manila is no longer just a one night stop for tourists. Demand for long-term housing on the rise and the Philippine capital is delivering. As investments open up the Philippine market, Manila is seeing an influx of outside visitors staying for longer periods of time. Government visa reforms include an increase in the visa- free privileges for visitors from 166 territories from 21 to 30 days and a 30-day visa-free stay for Chinese nationals travelling to the Philippines as part of a tour group. “In the near future, we also anticipate the issuance of a special long-stay visa of six months for active retirees,” said officer-in-charge of the Department of Tourism Evelyn Alcaraz-Macayayong. As Manila continues to move forward with new building projects, other countries have begun to take notice of the boom taking place. The Philippines recently became the first country in the world to have a resident investment advisor to China and with this kind of attention, serviced apartments are taking a lead in terms of housing options. Business and leisure travellers looking for long term accommodation are being offered more than the a standard stay. Fraser Place Manila is another high-end giant, suitable for both business and leisure travel. With rates between PHP11,100 (US$259) to PHP18,500 (US$431) guests enjoy floor-to-ceiling picture windows, gourmet kitchens, and unique Sky Gardens. Then there are independent options like Picasso Boutique Serviced Residences located in the heart of Salcedo Village, where guests are greeted with the same unique qualities as the artist for which it is named. The designers treated all the rooms as a canvas, with a colour palette inspired by Picasso. Architect Dominic Galicia incorporated cubism into the building’s design and along with interior designer Tina Periquet, turned an old landmark into what is now labelled as “something new and exciting” for Manila. The facade is layered with pictures that come together only when one stands from a certain angle. Inside, ceiling mirrors reflect what is happening on the streets below, while an in-house art gallery showcases new art every few months. A full service wellness centre spa and the Brasserie Boheme restaurant can also be found within the ultra- modern Boutique. When creating a new place for visitors to stay, developers in Manila are ensuring that unique aspects such as Oakwood’s pet- friendly rooms or Picasso’s artist- themed interiors will launch Manila into the world of high-calibre serviced living. The 30-storey twin tower Ascott Makati (formerly Oakwood Premier apartments) is right smack in the middle of the Ayala Center and the Glorietta 4 shopping mall. Its 306 apartments include studios, one to three-bedroom residences and penthouses. Make use of Broadband access in each apartment at US$20 per day or go Wireless in the public areas. Long-staying guests may also avail of special rates. Expect an outdoor pool, two outdoor tennis courts, spa and massage rooms. In-room facilities include TV, fridge, microwave, toaster, cooking range and coffee machine. Security may be a tad heavy at times. A Filipina friend of mine with a family pedigree demanding instant prostration has been stopped several times at the elevator by anxious guards suspicious of Asian faces. She told me she made it to the upper-floor restaurants, eventually. 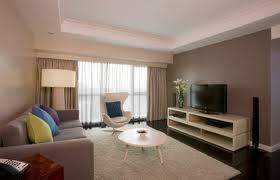 Another Makati service apartment and longstay option is its sister-property Somerset Olympia Makati. Close to The Peninsula, it is the cheapest of three Somersets in town, and with an excellent location though cabs are not the easiest to come by on Makati Avenue at peak hours. A quality option for a Makati service apartment is Fraser Place Manila, near Salcedo Village not far from the Mandarin Oriental. Expect well-appointed residences with jet pools and multi-point showers, TV with DVD hook-up, Broadband, hairdryer, large refrigerator, microwave, cutlery and iron with ironing board. A handy feature is all apartments come with a maid’s room and toilet. There is also an open-air pool, a play area for kids, a wading pool, gym, and business centre for the dads. Internet is complimentary with most packages. Bach Johann M. Sebastian, senior vice-president for corporate planning of JG Summit Holdings, Inc., the parent company of Robinsons Land, said the company is still studying the construction of the so-called Summit Hotels. “They are all still under study,” he said when asked about the timetable of the construction. Mr. Sebastian, however, said that the two might be built in Mactan, Cebu and Ortigas Center in Mandaluyong City. “We are looking at the former Medical City property… [for] the Sonata Complex. The Sonata Complex has four towers, one of them will house a planned service-type apartment hotel,” he said. He said the Summit Hotel would have at least a hundred rooms. The other three towers in the Sonata Complex are residential condominiums Sonata Towers 1 and 2 and the 42-storey high-rise development The Allegro, which is expected to be finished by 2016. The entire development sits on a 10,509-square meter lot along San Miguel Ave.
Last year, the company opened its first budget hotel called Go Hotel in Mandaluyong City, offering 225 rooms with sizes ranging from 16-22 sq.m each. The company had said that it would be building 30 Go Hotels in the next five years. The low-cost hotel is the fifth hotel property of Robinsons Land next to the 285-room Crowne Plaza Galleria Manila, 263-room Holiday Inn Galleria Manila, 210-room Cebu Midtown Hotel and the 108-room Summit Ridge Hotel Tagaytay. In Cebu, the developer is building the 25-storey Azalea Place by Robinsons Residences which is seen to strengthen its presence in the province, where the company’s founders, the Gokongweis, are originally based. This comes on top of earlier developments elsewhere in the province such as AmiSa, Aspen Heights, and Blue Coast Residences, which cater to different segments under various brands. Robinsons Land, the property residential arm of listed JG Summit, is also into shopping malls and office space leasing. As of September 2010, the company’s portfolio includes 29 shopping malls, 27 residential projects, seven office buildings, and five hotels. Robinsons Land’s net income for the nine months ending in June this year rose by 18% to P3.048 billion from year-ago levels. Robinsons Land affiliates also have interests in aviation and telecommunications. Robinsons Land shares went by 2.3% to P12.46 on Friday from its previous close.